For the full programme see here but this is the poetry on offer. I would love to go to the Laureate Circle but can’t make it at this stage (might just fly down on a whim!). I would really like to post pieces on any of the poetry events at the festival. Any takers? This entry was posted in NZ author, NZ Literary Festivals, NZ poetry, NZ poetry event, NZ Poets, Uncategorized and tagged Bill Manhire, Brian Turner, Cilla McQueen, CK Stead, Elizabeth Smither, h 11th 5pm 1, Ian Wedde, Jenny Bornholdt, Michele Leggott, Vincent O'Sullivan on January 30, 2016 by Paula Green. This entry was posted in NZ poetry, Uncategorized on January 30, 2016 by Paula Green. Ika 3 looks cool. It is the literature and arts journal from Manukau Institute of Technology and is edited by Anne Kennedy. Anne is a poet and novelist and she is about to head to Victoria University where she will be the 2016 Writer in Residence. The internal design is fresh. The issue looks like it is wrapped in brown paper. It feels slightly rough to the hand. It features prose, poetry and art from students and staff, and stretches out to include work by well known writers from both here and overseas. The mix is eclectic. There are appealing grades/gradients of lyricism and subject matter, but what makes this issue pop out from others is the political elbow that juts out, the raw angles, the Pacific Island presence. Compared with this journal, others seemed saturated in white. To have such diverse reading lines in to brown skinned voices makes this newish journal a vital presence within our writing/reading options. A bundle of poets made me snap to attention. I love the playfulness of Tusiata Avia’s ‘We are the diaspora of us all’ where play becomes play with a potent bite. I love the way Chris Tse’s ‘This house’ is inventive, detail rich, personal, kinetic and catches both heart and mind. Faith Wilson’s ‘Echo (bootleg remix)’ is a poem bisected in two and the interplay of dual voices is sharp, hard, heart hitting. You need to read again to find different paths. Donovan Kūhiō Colleps wraps place and moment so acutely in ‘Muscular Dreams,’ and I love the way lines coil and repeat. J A Vili’s ‘Mother’s Rope’ is spare, just a handful of words on the page, but it is the white hot core of the issue. Sophie Van Waarden’s ‘Water Girl’ confirms that this young poet writes with linguistic grace, verve and surprise and is an emerging poet to watch. There is much more. See some treats below in the photos, including Anna Jackson’s surprising ‘Leaving the hotel room.’ This journal is worth a subscription! The art is mind catching as well as eye-catching. Again I come back to the words fresh and vital. Work is about to start on the next issue. Submissions for Ika 4 are due by February 1st. We invite submissions across Moananui for Ika 4 from emerging to established practitioners in the fields of writing (poetry, prose fiction, non-fiction), performance, and visual art. Ika 4 will be published in print and accompanied by a website for moving image and performance, to be launched as part of the Auckland Writers Festival in May 2016. Electronic documents are preferred, but printouts together with a self-addressed envelope may be mailed to: Ika Journal, Faculty of Creative Arts, Manukau Institute of Technology, Private Bag, 9400, South Auckland Mail Centre 224, New Zealand. Video works must be in the form of mp4 files and can be submitted via private Vimeo / Youtube links. The submission limits are: eight poems, eight images, three video/performances, 7,000 words of prose. This entry was posted in NZ author, NZ poetry, NZ poetry journal, Uncategorized and tagged Anne Kennedy, Chris Tse, Donovan Kuhuio Colleps, Faith Wilson, he words, Ika, J A Vili, Sophie Van Waarden, Tusiata Avia on January 29, 2016 by Paula Green. 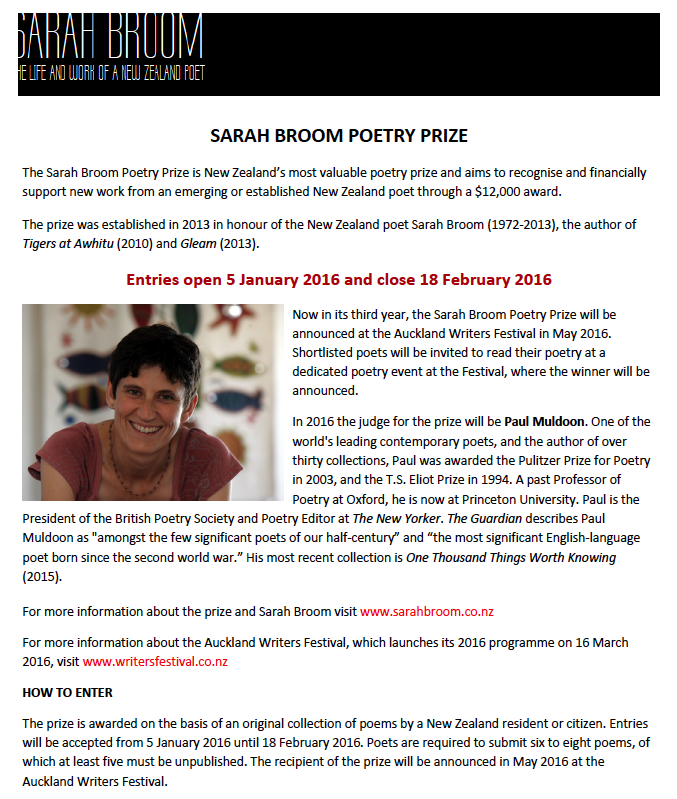 Now in its third year, the Sarah Broom Poetry Prize will be announced at the Auckland Writers Festival in May 2016. Shortlisted poets will be invited to read their poetry at a dedicated poetry event at the Festival, where the winner will be announced. In 2016 the judge for the prize will be Paul Muldoon. One of the world’s leading contemporary poets, and the author of over thirty collections, Paul was awarded the Pulitzer Prize for Poetry in 2003, and the T.S. Eliot Prize in 1994. A past Professor of Poetry at Oxford, he is now at Princeton University. Paul is the President of the British Poetry Society and Poetry Editor at The New Yorker. The Guardian describes Paul Muldoon as “amongst the few significant poets of our half-century” and “the most significant English-language poet born since the second world war.” His most recent collection is One Thousand Things Worth Knowing (2015). For more information about the prize and Sarah Broom visit here. For more information about the Auckland Writers Festival, which launches its 2016 programme on 16 March 2016, visit here. 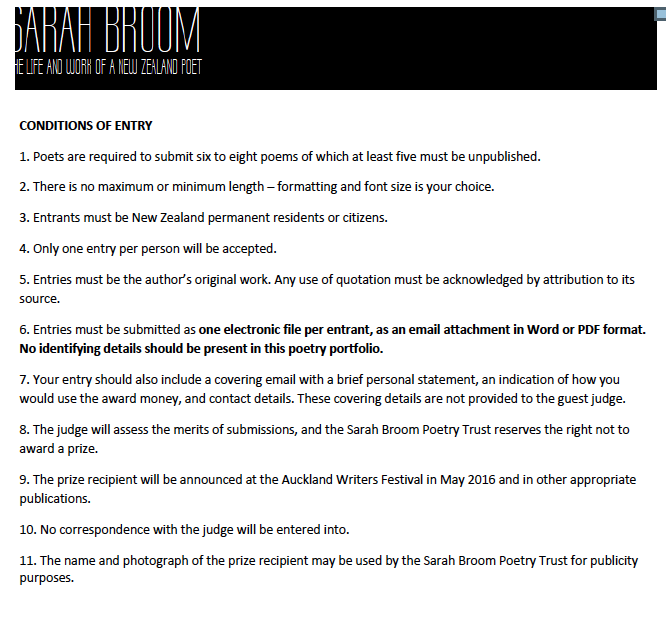 The prize is awarded on the basis of an original collection of poems by a New Zealand resident or citizen. Entries will be accepted from 5 January 2016 until 18 February 2016. Poets are required to submit six to eight poems, of which at least five must be unpublished. The recipient of the prize will be announced in May 2016 at the Auckland Writers Festival. This entry was posted in Uncategorized on January 29, 2016 by Paula Green. Time to kick start Poetry Shelf back to life for 2016 as I get set to kick off a moon boot! This year I will post poetry reviews, interviews with New Zealand poets, poetry news from anywhere, event details, competition details, poems that I fall in love with, and whatever else takes my fancy. I particularly want to keep you aware of poetry books that are released in New Zealand. With a big new book on the go, I cannot promise to review all books released, but this year I do want to flag all arrivals. Please send copies so I can highlight them (and perhaps review, set up an interview, post a poem from) on the blog. I do want to support the grassroot presses! See address below. I am also happy to consider pieces by other writers whether reviews, interviews or musings on poetry. This blog continues to run on the currency of love so I cannot pay people who contribute. New Zealand desperately needs poetry forums. Poetry books so seldom get attention in mainstream media. In 2016 I will work hard to celebrate and critique our poetry and create an ongoing resource for poetry fans. Any way you can think of to strengthen this aim is much appreciated. We are planning a Ruapehu Writers Festival for 17-20th March. It’ll be the first of its kind in the Ruapehu area. The inspiration behind it came from wanting to take literary festivals out of the metropolitan areas and into small town New Zealand. Our rural towns, mountains, rivers and landscapes have inspired some remarkable writing and we want these words to be heard in the places that inspired them. We also want to inspire a new generation of readers and writers. But we need your support to make this idea happen. We’re launching a fundraising campaign today to raise the funding we need to get the festival off the ground. We have secured some funding from Creative NZ and we’ll raise some income from selling tickets, but we still need another $7,000 to make the festival happen. So we’re asking our community and supporters to get on board and donate any amount you can, big or small, through our Boosted website here. You can read more about the festival there too. Please help us make the festival a huge success – every donation, big or small, will make a huge difference. Your donations will be tax deductible as the website is run through the Arts Foundation so you’ll get a receipt. And please help us spread the word by sharing on social media and telling your friends and family, and of course buy your tickets to come along too! You can buy tickets here. This entry was posted in NZ Literary Festivals, Uncategorized and tagged Ruapehu Writers Festival on January 18, 2016 by Paula Green. Sarah Broom Poetry Award now open for entries – and an announcement of exciting new judge! This exciting news! Bravo for keeping this vital competition up and running. Let’s hope entries come from far and wide. This entry was posted in NZ poetry and tagged Sarah Broom Poetry Award on January 5, 2016 by Paula Green.